Rare is celebrating its 30th birthday with the games Rare Replay that brings numerous classics to life such as Banjo-Kazooie or Battletoads on Xbox One. A great offer with plenty of choices. Here we have listed top 5 titles that you should not miss them under any circumstances! 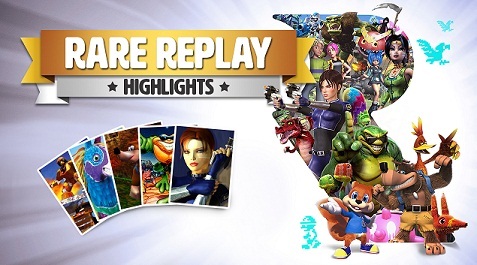 Rare 30 years combined in one game - Rare Replay with titles like Sabre Wolf, Battletoads, Banjo Kazooie, Perfect Dark and Conker's Bad Fur Day has almost all the important classics of the rich history of the English cult Studios. Course for licensing reasons, the Donkey Kong Country trilogy and Donkey Kong 64 is missing (the rights are held by Nintendo), and the N64 classic GoldenEye (the Bond license stood at Activision, is currently not assigned). Battletoads (also known as Super Battletoads) was published in 1994 as an arcade and has been implemented for home consoles. Accordingly, it is so nice that we have the game now as "Battletoads Arcade" finally able to enjoy at home thanks to Rare Replay. The game is a beat 'em up by all kinds of opponents and are allowed clobber with the eponymous Battletoads - because if you do have it! Battletoads is in fact already very demanding of tradition and also demands a lot from experienced players. It is all the more satisfying as well as the six stages eventually to master at last. Fun of the title largely thanks to the wacky animation and the bawdy humor that made me laugh again. Kameo: Elements of Power was first released only for the GameCube, then was developed for the first Xbox, finally appeared as a launch title for the Xbox 360 and is now it is playable on the Xbox One thanks Rare Replay. Sure, it may perhaps not quite match the outstanding quality of the golden age under Nintendo, but it's still a very good game that has its time a lot of fun to me. Kameo is reminiscent of the gameplay at Zelda and has through the metamorphoses a significant loan to Majora's Mask. By pressing a button, the eponymous heroine Kameo can transform into various shapes. You can use his different skills in the fight against opponents and are essential in order to master the various puzzles and skill-testing tasks in the game. Even several years after the publication of the world still speak of Golden Eye. Unfortunately, the game is mentioned as initially not included in the package because the Bond license is not with Rare or Microsoft. Perfect Dark, the successors in the spirit, the quality of the classic but in my opinion is second to none. In fact, the action-packed adventures of Agent Joanna Dark even a tad better I like it! One should note that Shooter have evolved on home consoles thanks to Halo and Co. Since then, of course - Perfect Dark feels no longer fresh as a daisy. When in Rare Replay version contained the revised version, which appeared its time as downloadable titles for the Xbox 360. In this form, Perfect Dark is very playable, still makes a lot of fun and is just highly recommended from a historical perspective. Do I really have to lose big words about Banjo Kazooie? The 3D platformer was on the N64 is an absolute blast, even compared with Super Mario 64 looks old. I am inclined to agree. Super Mario 64 may have defined as platformer in 3D, but Banjo Kazooie has perfected the formula. Varied tasks, colorful, creatively designed worlds, a buttery smooth control and on top of that a pack of humor. Banjo Kazooie does still just so much fun! Again, you get the Rare Replay incidentally offer the revised 360 version that has been upgraded to the higher resolution and wide screen. Conker's Bad Fur Day is one of the funniest games that I have ever appeared. The crude humor with a penchant for obscene is not for the faint of heart. For Friends of black humor, it is pure gold. Conker should actually be even an innocent, child-friendly platforming game - and just sees the game well out. But issues such as alcohol, the high degree of violence and the harsh, blunt expression of the characters related to the colorful world of the game in a bad contrast. There are many funny allusions to various films. The intro is as a tribute to A Clockwork Orange. As the game appeared very late to N64 times, Conker was time past for many people. The version in Rare Replay is therefore the perfect opportunity to catch this classic, mainly due to the extortionate price that you would pay for an original module. In addition, a lot of control with the most worn-N64 controllers always very difficult and I am alone grateful that I can now play the game with an Xbox One controller.